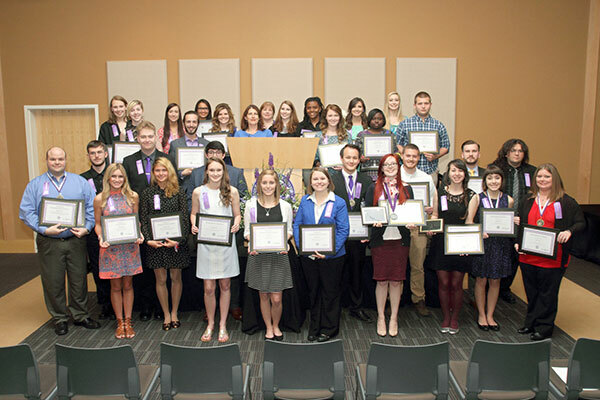 Middle Georgia State University recognized more than 50 students at the 2016 Honors Convocation, held April 6, for their academic achievements. Kylie E. Mims of Macon, who recently completed her Bachelor of Science in Psychology, is the 2016 President’s Scholar, the highest award Middle Georgia State gives to a graduating senior. The President’s Scholar must have an outstanding academic record, significant campus/community involvement and demonstrate characteristics indicating the promise of a successful future. Ashleigh Rebekah Knight of Macon is the 2016 Academic Recognition Day Scholar. Knight graduates this spring with a Bachelor of Science in Early Childhood Education. Each year the Chancellor of the University System of Georgia asks the institutions to select one student representative of outstanding scholastic achievement. The University System recognizes these students each year at a ceremony in Atlanta.